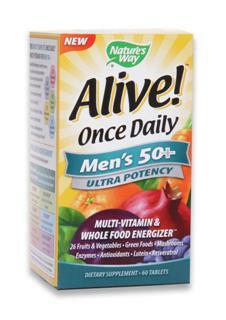 The Most Complete Once Daily Multivitamin For Men 50+. Alive! Ultra Potency is nutrition you can feel with more energizing nutrients from more natural sources than other multi-vitamin brands. 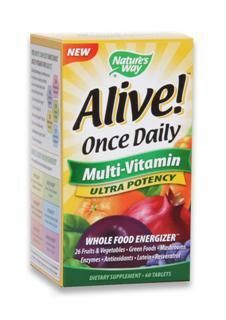 Alive Once Daily is a potent multi vitamin containing 23 vitamins and minerals, 12 digestive enzymes, 14 green foods and 12 organically grown mushrooms. This formula includes unique blends including, eleuthero, rhodiola nd korean ginseng for stamina and energy, saw palmetto and lycopene for prostate health, resveratrol and CoQ10 and hawthorn for cardiovascular support. It is suggested as with many supplements that you take 1 tablet daily with food or a meal and plenty of water. Food should preferably be a balanced meal that include protein, carbohydrates, and fat to stimulate opitmum acid secretion in the stomach, which will allow for better absorption. Directions: Take 1 tablet daily, preferably with food. As with any supplement, if you are taking medication consult your doctor before use. Not formulated for women or children. Do not exceed recommended use. Question: Since I started taking these, I have been getting a stomach achenauseous feeling a couple hours later. Is this a known side affect? I took a GNC Men's multivitamin before this and didn't have this problem. Should I stop taking them?